Imagine the conductor not saying a thing, yet speaking volumes about leadership, communication, cooperation and synergy. The Silent Conductor is the world's premier motivational Non-Speaker. Using only simple percussion instruments, boundless energy and physical humour—and without uttering a word—the Silent Conductor takes an audience of untrained, unrehearsed individuals and turns them into a orchestra making music in amazing harmony. Whether his audience is 30 people in a conference room, 3 000 in an auditorium or 30 000 in a stadium, the outcome is always unity, creativity, collaboration and joy. It's an interactive musical experience that transcends all barriers of language and culture, reminds us of our fundamental connections, and shows how by working in concert, we can accomplish together what we could never even imagine achieving alone. Don't just get a Speaker for your next conference keynote, launch event or team-building session. Get an interactive experience more powerful than words. Steve Barnett was born and raised in South Africa, where he was infused with the country’s unique rhythms. He believes that the pulse and energy of his homeland are vital values to share with the world. 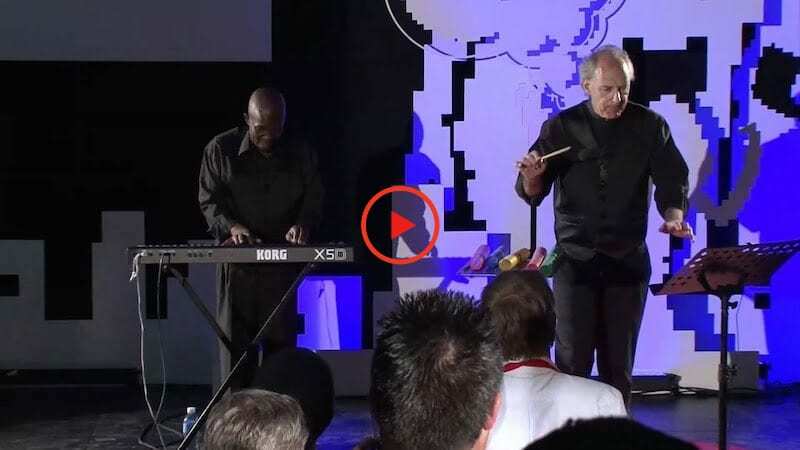 Steve has been a ‘Non-Speaker’ on the Professional Speakers circuit for the past 22 years, sharing his unique, non-verbal method of learning and leadership through musical metaphor in over 50 countries, performing at venues from the Royal Albert Hall to the MGM Grand. He was an Artistic Director of the Opening Ceremony of the Cricket World Cup In Cape Town, coordinating the full participation of an audience of over 40,000. He has shared the podium with luminaries such as Bill Clinton, Nelson Mandela and Desmond Tutu (who described him as having "an exceptional gift"). Steve is equally comfortable ‘not speaking’ at venues from bush lodges to boardrooms, with audiences from cabinet makers to cabinet ministers. "He has an exceptional gift"
"That was totally sensational. It was more than spirit-building… it was a spiritual experience. I can recommend you unreservedly to anyone. Thank you for transforming our staff in a day"
"One can talk about ‘unity’, one can intellectualize about it, but all of this conjecture appears as nothing when you experience the real thing. It's transcendent, it sets you free, it reveals our true potential." "Thank you for an overwhelming experience… we’re still being congratulated, thanked & complimented by our colleagues"
"There are certain things that cannot be described; they just have to be experienced. One such event was sitting in a West End London theatre last week beating out intricate percussion tunes in perfect harmony with 500 other members of the audience. Without saying a word Barnett led his audience-turned-orchestra merely by a dash of his hand and an expressive face… Quite spectacular!" To book The Silent Conductor for events and public appearances, please complete this form in as much detail as possible.